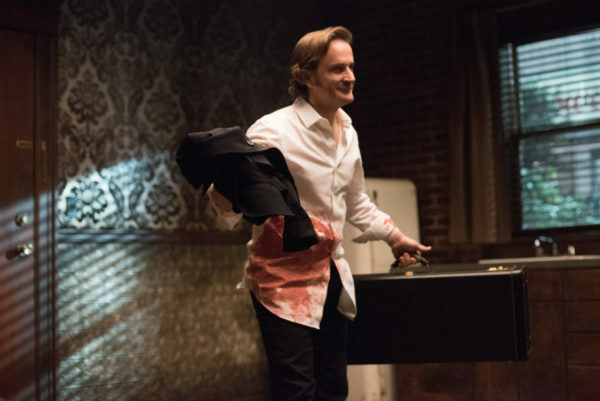 Gabriel’s back and he’s set on a mission of revenge! 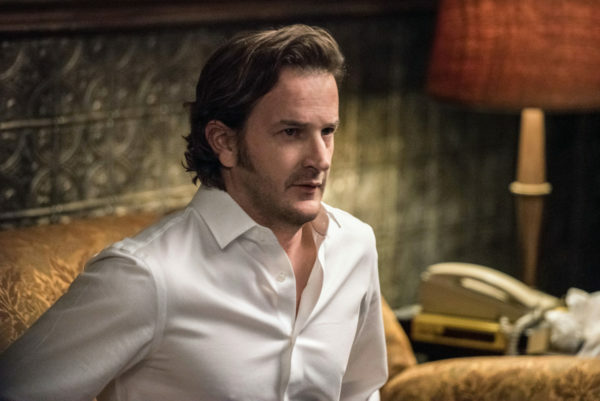 In the middle of it all, we got more insight into the Loki and Gabriel connection, the complex family dynamics going on, and the interesting relationship between Sam and Gabriel. I very much approve of this exploration! He’s tried to avoid his family problems, gone into witness protection on a few occasions, and suffered through years of torture at the hands of a demon. But Gabriel has not yet been beaten down completely. Fractured, but not beaten. And now he wants to seek revenge on the individuals who have caused his long-lasting damage. Gabriel’s already dealt with Asmodeus, but the demon isn’t the only player in this situation. Next up, a couple of Norse demigods! And that’s what allowed us to get a ton more backstory on not only where he was hiding out after his faked death, but also how Gabriel came to take on the mantle of Loki in the first place all those years ago. At the start of the episode, we saw Gabriel facing off with Fenrir Odensbane. The Norse demigod is on Gabriel’s kill list, one of the contributors to the archangel’s eventual kidnapping and torture. Well, Gabriel did manage to mark the name off his list, but not without damage to himself and calling attention to his plan. 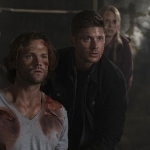 With a side wound and a need for some angel grace, he goes for a recharge from the Winchesters. Alas, they do not have the goods, so Gabriel really doesn’t have a need to stick around and get caught up in the whole family apocalypse drama that they’re cooking up. Well, plans often go astray, especially when you’ve got Fenrir’s brothers riled up and wanting to take on the archangel that dared to kill their brother. I enjoyed seeing Narfi and Sleipnir, though it would have been nice to have a bit more exploration into them. But what we lacked in Norse demigod history, we got a tremendous amount in regards to their father and his connection to Gabriel. After the archangel saved him originally, Loki made a deal with Gabriel. The archangel would take over Loki’s identity and appearance to escape from his Heavenly brethren, while the trickster went into hiding, away from his own family. Such a sweet deal, until Gabriel broke the one rule Loki had and got involved in the angelic drama yet again. And Gabriel’s choices led to the death of Loki’s father, Odin, so the trickster was bent on revenge. Hence the reason they turned him over to Asmodeus, setting off the years of torture the archangel had to suffer through. So much family drama all around! 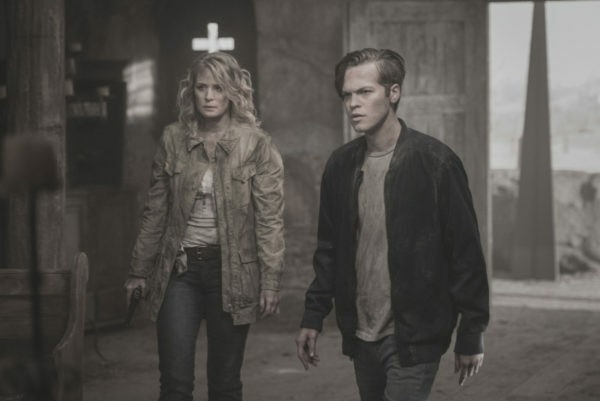 Additionally, this episode explored yet more of the connection between Sam and Gabriel. 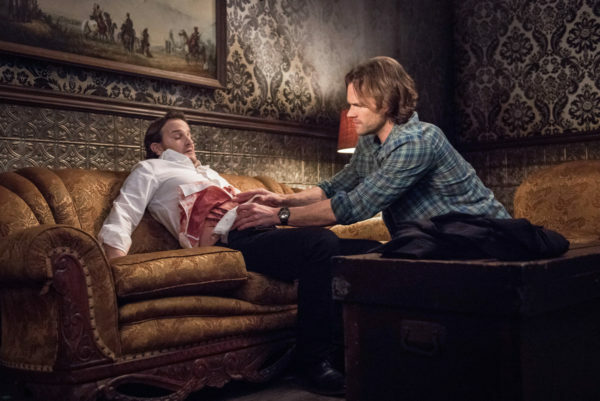 I’ve always loved their relationship, and felt like Gabriel took a particular interest in the younger Winchester ever since Dean’s repeated deaths in “Mystery Spot.” And when Sam’s threatened, Gabriel puts himself out there to help. Twice now, since his reappearance, he has stayed back until Sam’s put in danger, first by Asmodeus and then by Narfi. Then he lashes out and hurts those who hurt Sam. And Sam returns the favor as well. 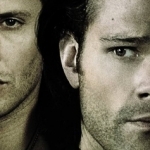 When Gabriel’s in need, he receives help from Sam despite Dean’s reluctance. I like that evolving bond and I hope they have more time to explore it, though I guess that depends on whether Gabriel survives the final battle or if he dies permanently this time around. Crossing my fingers for a happy outcome! Meanwhile, there’s drama going on over in Apocalypse!World, too. Jack’s bent on taking on Michael, even if it’s a fool’s mission. And his eagerness to protect those around him sadly backfires as a result of Michael’s sneaky plans. We got to see Michael’s plans for crossing the rift and a distraught Keven on a suicide mission. Now Jack and Mary’s allies are dead, the boy is distraught, and there’s no telling whether they will be able to defeat Michael before he crosses over to our world. 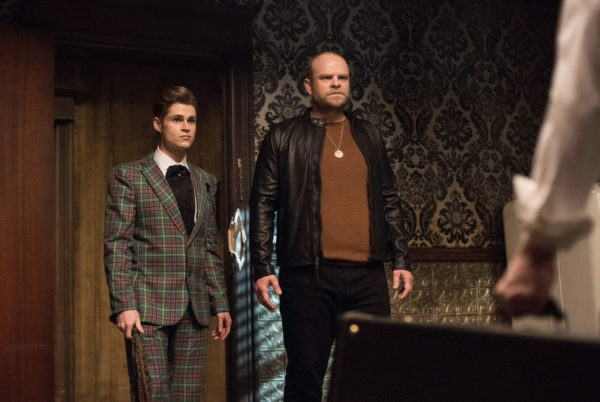 Maybe Dean, Sam, Cas, and Gabriel’s appearance next week will help in that situation, but I fear it will be a bloody battle that not everyone will walk away from. Not too many episodes left! The suspense and wariness of what will be is ever-increasing. Good luck, Team Free Will!